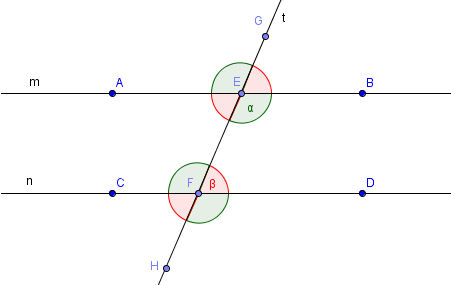 If two lines are drawn which intersect a third in such a way that the sum of the inner angles on one side is less than two right angles, then the two lines inevitably must intersect each other on that side if extended far enough. This is known as the fifth postulate or the Parallel Line postulate. The illustration of this axiom is shown below. In the illustration, the sum of and is less than , so the line will eventually meet on the right hand side. Note that the converse of the statement says that if the sum of and is , then the two lines are parallel. We call the line crossing the two parallel lines the transversal line. In the figure below, line t is a transversal to parallel lines and . The consequence of makes the angles of the same colors in the second figure congruent. For example, since , is also because they are linear pair. This implies that . The calculations for other angles are left to you as an exercise. In many textbooks, names are given to pairs of angles formed by two parallel lines and a transversal. Here are the names of such angles. corresponding angles – angles that will overlap if we make the parallel lines coincide. (e.g. and ). alternate interior angles – Angles that are between the two parallel lines and on the opposite part of the transversal (e.g. and ). alternate exterior angles – angles outside the plane bounded by the parallel lines and on the opposite part of the interval (e.g. and ). It is important that you familiarize yourself with these names because we will use them in future discussions.